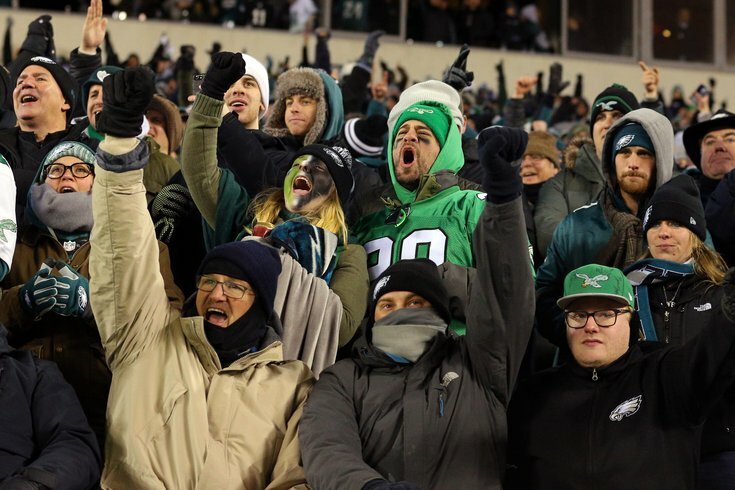 Philadelphia Eagles fans cheer during the fourth quarter against the Atlanta Falcons in the NFC Divisional playoff game at Lincoln Financial Field. This time, it was personal. The Eagles won a riveting, frightening NFL playoff game for the first time in nine years on Saturday night, and in every seat at Lincoln Financial Field, in bar stools throughout the Delaware Valley, and on couches everywhere else, it was personal. For so many of the fans that I speak with every day on my WIP radio show, the 2017-18 Eagles are a special team that has created a bond with the passionate people wearing their jerseys and screaming their chants. In recent memory, there hasn’t been a team so admired, so loved, as these Birds this season. In fact, these Eagles are a team ideally suited for this city, underdogs refusing to quit in the face of adversity, the Rocky Balboa of the NFL. So many of those fans who were there on Saturday are back at work today, working their drudgerous jobs with smiles on their faces. This is about as good a Monday as any of us will ever face. The emotion attached to this team is like none I have ever encountered. For example, on the air last week one fan cried because he had life-threatening brain surgery 11 months ago, and now he realizes how important it is for him to see the Eagles win a Super Bowl. Another goes to church singing prayers specifically rewritten for the Eagles. Even the pastor joins in now. And after 28 years talking sports in Philadelphia – that’s 112 different teams – I feel a connection with this group of players like no other because they got me through emergency gall-bladder surgery in a way no drug could accomplish. I respected the 2008 Phillies, but I love the 2017-18 Eagles. There’s a big difference. There were so many performances to admire on that cold, blustery day at the Linc. For the rest of this week, all of these people will feel the warmth of our appreciation. For starters, there is Doug Pederson, a coach branded as unqualified before the season, who made some brilliant play-calls and the right strategic decisions under duress. And how about Nick Foles, the backup quarterback who shook off early jitters and led the Eagles right through the wind with the season on the brink? The defense was majestic, beginning with a player, defensive tackle Fletcher Cox, whom I had begged to show up when we needed him the most. He was there on Saturday, all right, dominating the middle of the line. Brandon Graham, Jalen Mills (who defended the last pass), Malcolm Jenkins, Nigel Bradham – they were all heroes. It was a no secret that the Eagles were not expected to win on Saturday, given the fact they were the first No. 1 seed ever to serve as a home underdog against a No. 6 seed. What slipped by most people was that the “experts’ lined up against the Birds, too. According to BleedingGreenNation.com, only 23 percent, among over 100 forecasters, favored Philadelphia. Of course, Eagles fans did not agree. In our latest poll at WIP, 85 percent were predicting a victory, and they had a direct say in the matter – literally – by turning the Linc into the Vet, circa 1980, on Saturday. By most accounts, it was the loudest support the Birds had received in the 14-year history of the stadium. At the end, the city didn’t just celebrate; it vibrated. Whatever happens in the two games (we hope) remaining, these Eagles will always hold a special place in the minds and hearts of Philadelphia. Every one of us has a personal story to tell that will prove it. Now that the Eagles are in the NFC Championship Game, this is a good time to figure out who they have playing their most important position. All we know right now is his name: Nick Foles. After that, it’s all conjecture. The very idea that the fate of the Birds is in Foles’ hands is remarkable in its own right. He was the franchise quarterback here in 2013 – that season’s version of Carson Wentz – and he was historically good then. Two years later, he was playing (poorly) in St. Louis, and last year he was a scrub in Kansas City. Is Foles good or bad? Even this season reveals no pattern. He was terrific in pulling out the game in Los Angeles after Wentz tore his ACL, good the next week against the Giants, bad in a tight win over Oakland, and abysmal in a cameo against Dallas. On Saturday, he was both. His first pass looked like a duck struggling against the wind, rescued only by an official’s penalty flag. Foles remained inept until, without warning, he suddenly found his groove again in the second quarter. His numbers – 23 for 30, 246 yards, 100 passer rating – were significantly better than Matt Ryan’s – and Ryan is supposedly a potential Hall of Famer. Go figure. The saddest sight in an otherwise invigorating day was Wentz on the sideline, propped up by a crutch under his right armpit. It was impossible not to fantasize over how much better the Eagles would be if only he hadn’t been injured. It’s not easy to lose the league MVP and still go to the Super Bowl. Still, what really stood out in Foles’ performance on Saturday was how similar he looked to the 2013 version when coach Doug Pederson occasionally reverted to the run-pass-option system run then by Chip Kelly, the only system in which Foles has truly prospered. Is there a way to channel that Foles for two more games? With Nick Foles, anything is possible. Or impossible. Three entirely separate stories unfolded over the past week that combined to provide a perfect solution to the current problems of the 76ers. I’m betting that you missed the connection. First, Jon Gruden gave up his ESPN analyst job to take a $100-million deal to coach in Oakland. Then Villanova moved back to No. 1 in the NCAA basketball polls. And finally, the Sixers blew a 22-point lead in London to fall back under .500. Gruden’s decision to give up a job he loved – but was terrible at – to take the biggest coaching payday in sports history proved everyone has a price. Villanova’s ascension was just the latest affirmation that Jay Wright is the best college coach in America. And the latest blown lead showed Brett Brown is floundering in his fifth season as Sixers coach. One plus one plus one equals three. If Gruden had a price, so does Wright, and what better NBA job to accept that the one right in his own backyard? Is there one person reading this who thinks Brown is a better coach than Wright? Does anyone not think Wright would be a major upgrade? For many years, Wright has maintained that he is happy at Villanova, where he has less than half as many games to coach per season as the pros, and where he doesn’t have to deal with tyrant owners and petulant pro players. There are valid arguments. However, what does Wright, at 56, still have to prove in college basketball? He is an extraordinary judge of talent, a brilliant manager of personalities – many of whom are around the same age as the kids on the 76ers right now – and an accomplished strategist. He’s also no dummy. The Sixers’ roster is playoff-caliber today, thanks to four years of tanking. Elite young athletes like Joel Embiid and Ben Simmons just need time and a savvy coach to develop into the kind of stars around which a champion can be built. It’s safe to say the Sixers will be better next season, with or without Wright. The Villanova coach has everything to gain and very little to lose. Which brings us to the money. If Gruden is worth $100 million after sitting out for nine years, what is Jay Wright worth? And it goes without saying that billionaire owner Joshua Harris has the money. The real question is, does he have the foresight? If I were the owner of the Sixers – I’m a few billion dollars short at the moment – I would call Wright the day after the college season is over and make him an offer he can’t refuse. The Sixers desperately need Jay Wright – and he needs them, too. •	OK, I give up. Two catches by Atlanta in their final drive were almost identical, yet they were called differently. Mohammad Sanu went down with the point of the ball hitting the ground, causing it to move. No catch, it was ruled. Then, at the Eagles’ 2-yard-line, just before the deciding play, the same thing happened on a grab by Julio Jones. This time it was ruled good. So what is a catch? I still have no idea – and neither do the officials. •	The most amazing part of the Eagles’ win was how many dumb plays they made and still somehow prevailed. They fumbled four times, losing two. They lined up offsides. They dropped at least two sure interceptions. They missed an extra point. They booted a kickoff out of bounds. And they won. It is not a good idea to play that way against Minnesota on Sunday. I’m just saying. •	Tony Romo continues to bamboozle his adoring media critics, despite his incessant blabber and often-wrong observations. For most of the first half in the CBS broadcast of Titans-Patriots on Saturday night, he ripped the oddsmakers who had the Pats as a two-touchdown favorite. “This is going to be a close game,” he insisted. Final score: Patriots 35-Titans 14. Not a peep about the odds in the second half by Romo, of course. •	The biggest waste of time in sports are All-Star games, a statement proven true again this season when Flyers’ MVP Sean Couturier was denied a spot despite a brilliant first half. Before that snub, it was Jason Kelce’s turn to get disrespected, ignored despite the best season of his Eagles career. Fans have some say in these popularity contests, but the leagues do get to correct the most obvious mistakes. Why don’t they? •	The bad news in London is that the Sixers lost to Boston there last week. The good news is, the Eagles will be in jolly old England for a game against Jacksonville just before Halloween next season. My guess is, the London tabloids are already plotting how to get the money photo, a shot with Prince Harry and his double, Carson Wentz, together. I’ve even got the front-page headline: Red October.